I did a fair amount of online research and put three HD TVs on my see and compare list based on features. The best features were on a Samsung 52 inch LN52B750 that also happened to be on sale for $600 off at the time. The picture quality from High Def sources is absolutely stunning. Breathtaking. Reading all the user guides which were available on line (to get a good idea of features and performance) really focused me on the Samsung because in addition to all the jacks you’d ever want (4 HDMI, 2 Component, 2 USB, PC, Ethernet, optical digital sound in and out plus some legacy analog ports) it looked to have full DLNA 1.5 support. DLNA “server” software is supplied (and is downloadable online from Samsung’s support site) but my instincts told me that this TV should work with Windows 7 native DLNA “Play To” support. In my opinion, the Play To/Streaming enhancements in Windows 7 are some of the coolest new features in Windows 7. 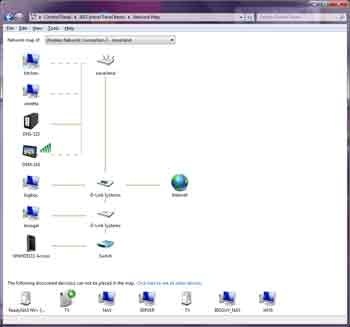 The team responsible for this work has an extensive blog post at http://blogs.msdn.com/e7/archive/2009/05/12/media-streaming-with-windows-7.aspx which explains and showcases the technologies involved. It’s really about an ecosystem of smart, transparently connected devices and something I’ve been passionate about for several years. With Windows 7, we’ve reached a real break through. Anyone, novices included, should be able to use and have fun with this technology set. It might give neighborhood geeks like me some free time back. 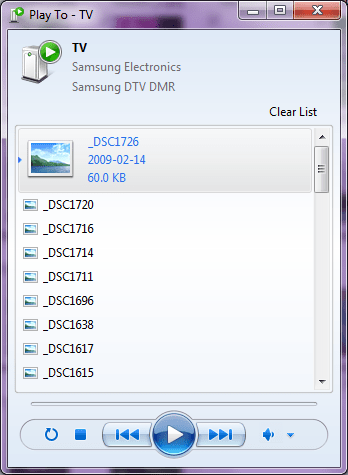 The Samsung LN52B750 (and all the B750 line apparently) include a full set of DLNA 1.5 features. 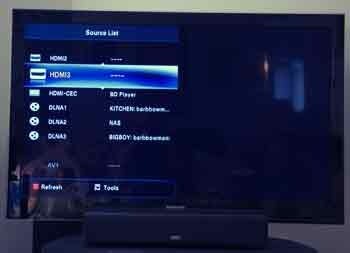 When I display the source list on the TV, all of my DLNA 1.0 and 1.5 devices were auto detected and displayed. You can see part of this list below, but it also detected my WHS box and additional computers. Note that it this point, the Samsung TV does not appear to be able to pull the list of available shared media from my Windows & computers (or other sources). A folder structure is displayed, but no content is visible to pull and stream. However, using Play To on a host Windows 7 machine (PUSH technology) works beautifully. Perhaps future firmware updates from Samsung will enable “pull”. I hope so! This TV is all about connectivity, including the Internet. The Samsung TV has onboard Ethernet and accepts a Samsung 802.11n wireless USB adapter. Out of the box, there are some Yahoo Widgets, including YouTube, Twitter, and Facebook. Samsung has done a great job with this. Hit the Internet button on the remote and you’re off and running. You can sign in with a existing Yahoo account, too. 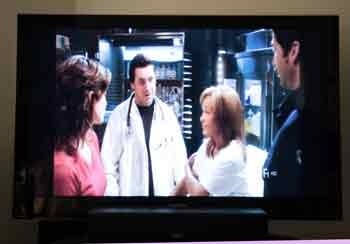 There is a handy on screen button to run TV ins a smaller window while the Widgets, etc. display. You can toggle back and forth. I’ve already used the connection to pull down a firmware upgrade for the TV itself. Another “well done” for Samsung. I have a fairly sophisticated home network. Everything here is dual homed. One network is Wireless N (both 2.4 and 5 GHz) p0lus GigE wired Ethernet and a second network is MoCA plus N. MoCA is short for multi media over COAX. W7 Network Map of one network segment. The line along the bottom is the second network. I’ve got desktops, laptops, digital picture frames, NAS boxes, wireless access points and of course my new Samsung TV networked. Below is a partial view of my networked home (some devices are not powered on all the time). Did I mention that my new TV includes a wired Ethernet jack and can accept an 802.11n (2.4 GHz) special USB adapter? Samsung offers a wireless 802.11n USB adapter as an accessory. It is powered by a Ralink 2880 radio. I was hoping that any wireless N USB adapter would work since I have a bucketful of those here, but only the Samsung branded one will function. 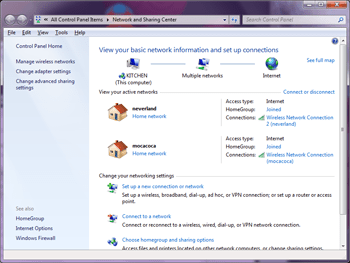 Samsung supports Windows Connect Now (WCN) via push button and of course you can manually configure the wireless network. You can access the settings for media streaming options from several places. One way to do this is from the Network Window. 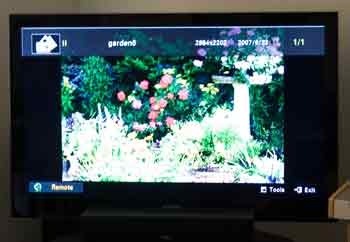 Right click the device (TV in this case) and then select Media streaming options from the shortcut menu that displays. 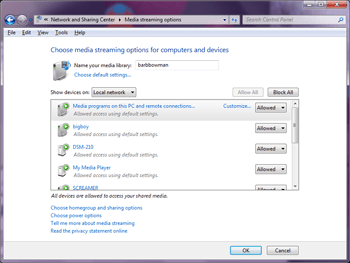 From the Media streaming options window you can then specify what permissions to set for each computer and device. This is very easy and intuitive. Once permissions are enabled, it’s time to have a LOT of fun. 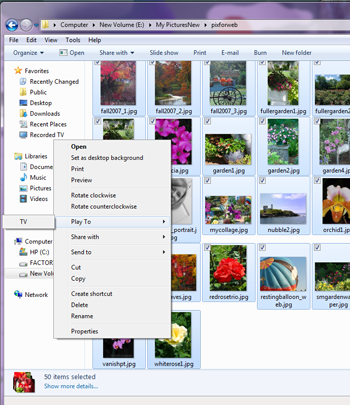 From within Windows Explorer, if there is an available device on the network, right clicking a media file or a group of selected media files invokes a shortcut menu that offers Play To as a choice. Once you’ve sent media on its way using this method, a Play To window opens with a list of the items selected. You can drag and drop additional content into this window and even mix and match images, music, recorded TV (non protected). 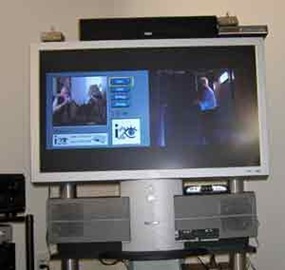 On the TV, the incoming streamed content is auto sensed and auto displayed. You’ll see some meta data briefly as shown below. The meta data header will then disappear and you’ll get a nicely displayed image. The same technique works for music files, at least for MP3’s. I was not able to send WMA ripped music using Play To. Microsoft has put me in touch with Samsung, and they are investigating. Samsung obviously wants to get this right and I’m hopeful that this will be fixed with a firmware update. Note that since I’m running sound through a Home Theater Receiver, I do have to switch the receiver to a different audio input. 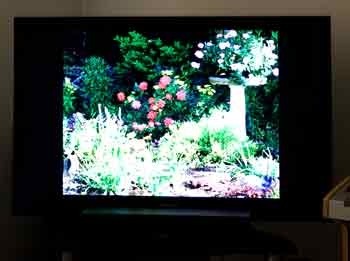 I ran a digital optical cable from the TV to the receiver and that handles the sound streamed over the network perfectly. I’ve saved the best (in my mind anyway) for last. And that is Recorded TV from Windows Media Center. Frankly speaking, I was VERY surprised at the support for this. 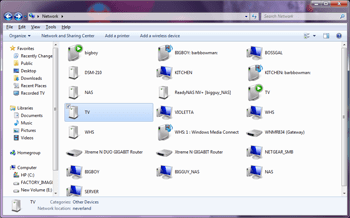 Both dvr-ms and wtv formats ARE supported. 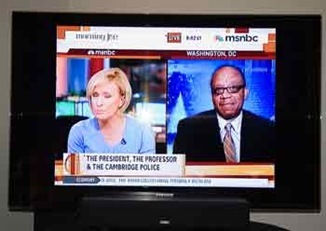 It is important to note that only non protected (non DRM’d) recorded TV will work. I hope Microsoft can change this severe limitation, because this is a kickass feature and then some. 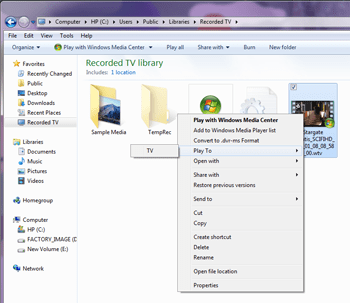 I’d also like to see Play To supported inside the Windows Media Center interface itself. In the image below, I’ve right clicked an episode of Stargate Atlantis (non protected recording from the Sci Fi – now Sy Fy – channel), And once again, Play To (TV) appears as a choice. My mouth dropped to the floor and I was speechless when this actually worked (see screenshot below). I think this is the future and that I found a time machine. It takes a lot to get me excited and I’m VERY excited about this technology. My virtual hat is tipped to Microsoft for the slick implementation and to Samsung for being visionary and being tone of the first to embrace this very cool convergent world. And if you have read this far, I have two recommendations for you. The first is to upgrade to Windows 7 just as soon as you can and the second is, if you are shopping for a new HDTV, the Samsung B750 line will rock your world. This entry was posted in Uncategorized and tagged DLNA, Windows 7, Windows Media Streaming. Bookmark the permalink.